Chinese President Xi Jinping has stated that China's proposed Silk Road Economic Belt will impact upon three billion people and will unite the biggest market in the world with "unparalleled potential". Reconnecting China with Eurasia and South-East Asia has now become a cornerstone of China's foreign policy, with new banks being set up, billions of dollars of loans being made and diplomatic moves all being taken to ensure its success. It has been assigned to Cambridge University's third year undergraduate course on China in the International Order. Chris Devonshire-Ellis is the Chairman and founding partner of Dezan Shira & Associates and has travelled extensively throughout China, Central Asia, Russia and South-East Asia. 174 pages, includes maps, photographs and graphics. Offered at $39.99 for hardcover version (original price: $29.99, plus $10 for shipping costs). Offered at $19.99 for softcover version (original price: $9.99, plus $10 for shipping costs). - Kerry Brown, Director of the Lau China Institute, and Professor, Chinese Studies, Kings College, London; Associate Fellow, Asia Programme, Chatham House. - Mr. Joerg Wuttke, Chairman of the European Chamber of Commerce for China. "China's Silk Road outreach policies deserve extensive analysis and scrutiny. This study highlights both the challenges and opportunities that confront maritime and continental Asia as China articulates its growing hard power. Interesting times lie ahead." - Nirupama Rao, former Foreign Secretary of India and former Ambassador of India to China and the United States of America. "This remarkable book draws together the information on the creation of new 'Silk Roads' both on land and at sea as launched by Xi Jinping. 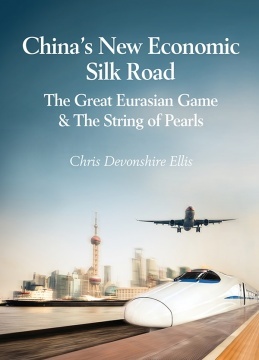 The magnitude of the concept which the author describes in the book, and the way that he covers the challenges that its implementation will present, underlines with great clarity China's bold ambitions and makes the case that its future historic potential will change the economic and social geography of 'Euro-Asia.' For anyone who is serious about looking ahead for business opportunities in China and the economic zones that are to be created along the entire length of the land corridor, this is a seminal work." - Christopher Hammerbeck, Senior Advisor to the Chinese Council for the Promotion of International Trade (CCPIT).